So I am kind of obsessed with street style fashion. It is like the reality TV of the fashion photograph world; a sneak peak into the style maven’s natural habit! Okay that may be a bit dramatic, but seriously I find myself browsing street style blogs like The Sartorialist or The Street Peeper on a daily basis. There is just something about seeing real people wearing runway worthy looks that is inspiring. Here are a few of my favorite street style looks… get inspired and try incorporating some of the pieces and styling choices into your wardrobe. 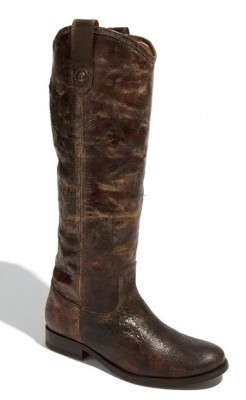 I am loving these worn leather, knee-high boots. Usually I’m not a huge fan of the worn or destroyed look but when paired with the edgy but classic trench it has such an ultra cool vibe. Though the boots look like they are her favorite pair and have been worn to the point of their current condition, you can actually buy a pair already worn for you. 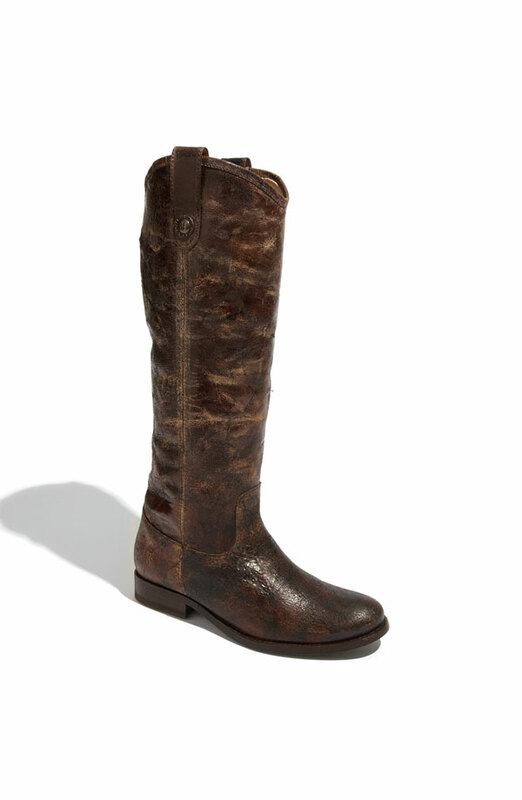 These Frye ‘Melissa Button’ Boot will have your friends thinking you’ve owned your favorite boots for years. Don’t be afraid to mix it up—all of it. Mix textures, patterns, fabrics, and color. I love that she is wearing leather, cotton, and a lightweight pant. The contrast between the sienna color boots and black leather jacket is my favorite part of the outfit. Combine styles. A classic ladylike coat, casual jeans and a modern handbag is simple, yet still makes a fashion statement. Try combining a few of your favorite styles and see what you end up with…it will more than likely be amazing. Sometimes the bag is what makes the shot. Often I find that I purchase a purse 80% because it is practical and 20% because I actually like the way it looks. Well, here is a permission to say “to heck with practicality!” and get a bag because it is fun, oversized, bejeweled, bright, crazy etc. Color blocking was a huge trend in 2011 and I don’t think it is a trend that ever really leaves us, whether we pay much attention to it or not. When hearing the words “color blocking” a vision of wild colors chosen from around the color wheel that are some how made to “go” rather than match is more than likely what occurs. But what about color blocking the same color in different shades? I think that this outfit taken in Paris is simply striking. Who would have thought—orange and orange.